Audio-Technica has introduced three new premium audiophile headphones: the over-ear ATH-AP2000Ti, the new flagship in-ear ATH-CK2000Ti and the in-ear ATH-CM2000Ti model. All three of the new headphones employ driver diaphragms with a DLC (diamond-like carbon) coating and a Permendur magnetic circuit, mounted in lightweight yet rigid titanium housings, and are Hi-Res Audio compatible with extended high-frequency response to beyond 40,000 Hz. 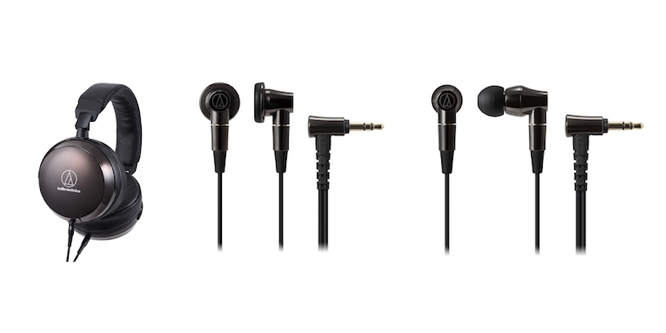 Audio-Technica’s A2DC (Audio-Designed Detachable Coaxial) jack can be used with included detachable 3.5 mm stereo mini-plug and 4.4 mm balanced mini-plug cables for either direct connectivity or use with headphone amplifiers and advanced DAPs. The closed-back ATH-AP2000Ti utilizes large-diameter 53 mm drivers with a wide 5 Hz –  50,000 Hz frequency response, and features Audio-Technica’s Core Mount Technology (CMT) which positions the driver’s voice coil in the middle of its housing to balance the acoustic space around the driver. The driver housings also employ the company’s Double Air Damping System (D.A.D.S.) for improved bass extension and detail. Soft, durable leather earpads offer long-wearing comfort, and three detachable cables are included: a 3.9-foot and 9.8-foot cable with a 3.5 mm stereo mini-plug and a 3.9-foot cable with a 4.4 mm five-pole balanced mini-plug and also includes a hard carrying case, 1/4-inch stereo adapter and cleaning cloth. The new top-of-the-line in-ear ATH-CK2000Ti is the finest in-ear model ever offered by the company, with dual-phase push-pull DLC drivers of different diameters (9.8 mm and 8.8.mm) that face each other but are wired out of phase, causing them to move in parallel with each other, promising lower harmonic distortion and improved bass control, output and sensitivity, along with better high-frequency response (5 – 45,000 Hz). Two 3.9-foot detachable cables with 3.5 mm standard and 4.4 mm balanced plugs are included, along with four sizes of silicone earplugs, three sizes of Comply foam eartips, and a hard carrying case and a cleaning cloth. Lastly, the ATH-CM2000Ti provides Hi-Res audio reproduction in a compact and attractive in-ear design that features 15.4 mm-diameter DLC drivers mounted in titanium housings with a 10 – 45,000 Hz frequency response. Included are two 3.9-foot detachable cables with 3.5 mm standard and 4.4 mm balanced plugs, one set of earpads, a hard carrying case and a cleaning cloth. All three of the new headphone models are expected to be available later this month.